Shanghai (China) – November 18, 2018 (travelindex) – On November 17, 2018 Gansu Tourism Promotion Event hit Shanghai, which theme is “Meet Silk Road Food & Ruyi Gansu”. 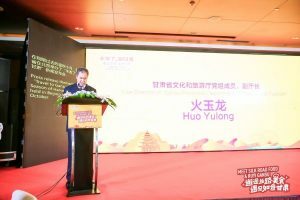 On that occasion, department head of the Ministry of Culture and Tourism of China and Huo Yulong, Vice Head and Leading Party Member of Gansu Provincial Department of Culture and Tourism appeared and delivered speeches. Besides, 160-odd persons including foreign travel buyer representatives, foreign student representatives, travel buyer representatives and peasant representatives from the Yangtze Delta region, tourist department and enterprise heads from the province’s cities and prefectures, domestic and overseas media reporters attended the event. Mr Huo stated in the speech that Gansu had held “A Harvest of Crops, A Happy Tour in Gansu” press conference in October, gaining widespread acclaim among the different walks of life and especially the media thanks to various preference policies enacted for billions of domestic peas-ants, myriads of tourists from China and abroad. So, we held this event to attract many more tourists. As Mr Huo said, Gansu has countless natural and cultural sights. It is a cradle of Chinese civilization indeed. And there is no lack of Mother Nature’s artworks. Even local ethnic charms are breathtaking. In brief, Gansu is a must-see destination! If you want to experience history, come to the province. If you want to delve into nature, come to the province. If you want to unwind and loosen up, come to the province. Everyone is welcome to Gansu! It will greet you all with open arms! Gorgeous sights, tasty foods, … none of them will let you down! “Gansu along the Silk Road, Gorgeous Things in Your Hand” tourist film focused on gourmet tours, culture trips, photography safaris, folk custom trips, winter-to-spring investigation tours, frontier sightseeings among other routes. In addition, the peasant representatives from the Yangtze Delta region and the European student representatives received Silk Road Self-Driving Passport and A Preference Manual for Travelling of Overseas Students separately. Iconic shows like Dunhuang music dance One Thousand Buddhas with Golden Halos, Qingyang shadow play Mak-ing Havoc in Heaven, Su’nan’s Yugur song and dance, Gannan Tibetan singing-playing unraveled the province’s indigenous culture and ethnic customs. Besides, the venue featured Interactive Sce-nario Zone and especially Zhengninglu Snack & Food Street in miniature, giving everyone a chance to relish local foods. Taste testing, PPT presentation, on-site dish making, exhibition and other means provided a panorama of the unique ingredients of diverse and delicious dishes and the profound culture at large. Lanzhou Beef Noodle, succulent Boiled Lamb, sweet Lily and Rice Por-ridge, assorted Tunuan Hot Pot and other gourmet foods stimulated every gourmet’ palate and made them feel the province’s culinary vibe. The aim of this event is to make Gansu better-known as a tourist brand, a land of inviting sights, abundant crops and culinary delights. Those culinary delights is regarded as the central focus of the event. In this way, the province will cooperate better with various partners and its economy will grow without end.